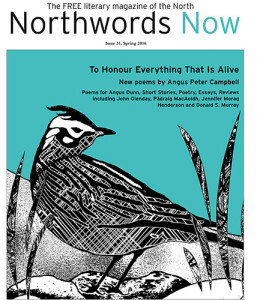 Northwords Now is an excellent Scottish literary journal, produced and published in the north of the country. Edited by the poet and academic, Chris Powici, Northwords Now brings good quality writng to the whole of the country and beyond. Chris asked me to review some new poetry books and pamphlets, and these are available on-line, along with the latest edition of the magazine. Read the reviews in Northwords Now 31, but more importantly, buy the books and pamphlets that grab you and dip into the wonderful creative minds there. They are a pleasure. These short reviews cover the work of ten poets: Ron Butlin; Eileen Carney Hulme; Jackie Kay; Stuart A Paterson; Sheena Blackhall; Donald Adamson; William Bonar; Robin Lindsay Wilson; Anne Connolly and Tracey Herd. It is impossible for me to pick out a favourite among these; the voices mingle, refelcting the diverse way that Scotland is. From the intense, packed pamphlets of Sheena Blackhall to the spare, powerful poems of Eileen Carney Hulme to the diversity of Ron Butlin, there is such a lot to be digesting. The new Makar, Jackie Kay, features beautifully here, and hers is one of several publications that are designed and typeset by Gerry Cambridge. When you read poetry, it is, of course, all about the words. However, the words that he brings so skillfully to the page sit easier, and are therefore better on the eye. Poetry book and pamphlet production is not only about the poet, but about the commitment of those who produce the work, and Gerry’s artistry adds to the feel and shape wonderfully. The publishers too, to bring such a lot of poetry to our tables: Red Squirrel (ten years on); Mariscat; Indigo Dreams; Cinammon, among others (not forgetting diehard, of course). While you are in Northwords Now 31, take the time to read Richie McCaffery’s review of In Casting Off, a short novel by J O Morgan, also in the on-line section. Other delights await in the paper version. You’ve got to love the place whaur extremes meet: Scotia Extremis, now at week 10 of a year-long exploration of the edges of Scotland and Scottish poetry. Week 10 is of the west, of the islands. The Balamorie of Sheenagh Pugh’s True Places is in the past, but very real in her extrapolation, despite Balamory being unreal on almost all its literal levels. Summerisle, by Hugh McMillan is almost super-real in its insight into this remote place and its resonances. 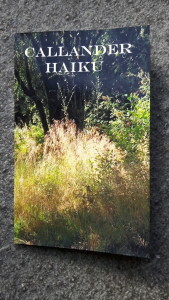 Sally Evans, poet and editor at diehard, has produced a great collection of haiku whose inspiration comes from Callander and the Callander Poetry Weekend that she and husband Ian run annually. Callander Haiku is tightly packed with work from a wide range of poets from all over Scotland and beyond. I am very pleased to say that there is a small batch from Charlie Gracie. Katrina Shepherd, one of Scotland’s best and most prolific haiku poets, features among the 39 poets, as do Elizabeth Rimmer, Colin Will and Finola Scott. Here is one of my poems that are included. Hens feature very strongly in the Callander Poetry Weekends. The form is played around with by some of the poets and this adds to the joy of this book. Sally has a knack for picking out ideas like this and making them happen. This is a lovely production and one that I will leaf through often. I’m having a whale of a time here at Moniack Mhor with my friends in the G2 writers’ group. It is a real joy to be in such a special place, with its hugely important place in supporting Scottish writing. I have been progressing my sequence Tales From The Dartry Mountains. Getting the chance, with other writers, to write and talk through ideas is great. Serious writing, serious eating, serious evenings of fun. Of course, procrastination is our constant friend: I do things like take lovely photos and write posts about Moniack Mhor for my website. Get back to work, Charlie!! 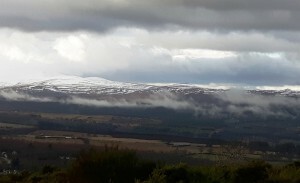 You can find out mmore about the work of Moniack Mhor by looking in their website. If you ahven’t had the chance to be here, you should. The whole place is geared to supporting our writing and the staff here are focussed on making it as useful as possible. Great place. Creative Scotland is looking for writers and other artists to become peer reviewers for their funded projects. It is part of their overall programme of evaluation of the work through their development of an Artistic and Creative Review Framework to create an open dialogue with our Regularly Funded Organisations (RFOs) around the artistic and creative quality of their work. Interested? Go to their website for more information. Another pair of beauties this week in Scotia Extremis. From two Makars, no less: Christine de Luca is Edinburgh’s and Elizabeth Rimmer, the Federation of Writers in Scotland’s. Both poems are great, each a reminisce of distant and recent cultural icons: Celtic Connections and The White Heather Club. You’ve got to love the humourous way Christine and Elizabeth take it on: humour and pathos. Ideal. Elizabeth, Charlie and Sally at Mugstock. July 2015. 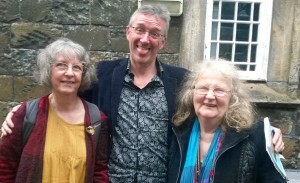 To add to the moment, here is a photo from the inaugural Mugstock Festival last year: Elizabeth Rimmer, Charlie Gracie and Sally Evans after our poetry reading there. 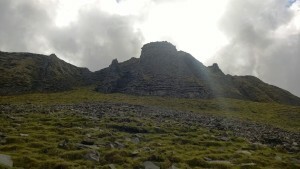 I’ve bee n particularly focussed recently on developing my sequence of Donegal and Leitrim poems (currently known as “Tales from the Dartry Mountains” in my head). They have been bubbling away for years as family stories, myths, beautiful landscape and the politics of an area full of ferment. For 2016, to help my focus, I am also resolved to go more often to the Scottish Writers’ Centre. First up is Jane Archer on short story writing on Tuesday night, 5th January. Should be a blast, so get yourself along. Delighted to have poems Stale Croissants, Edinburgh Cafe and The Basket Maker published in the latest twin edition of Poetry Scotland. Poetry Scotland is a great support to Scottish writing. It is always a joy to read the variety of work that Sally Evans publishes there from established and new poets.